Like the Common field speedwell (Veronica persica), the Slender speedwell (Veronica filiformis) has relatively large bright, blue and white flowers, each held at the end of a long stalk, well clear of the leaves. 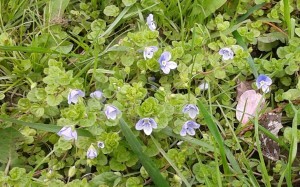 The Slender speedwell can occur on bare patches of soil but is most often seen in lawns. Its prostrate stems enable it to continue to grow despite regular mowing and it seems to be able to hold its own even when crowded by grass tillers. 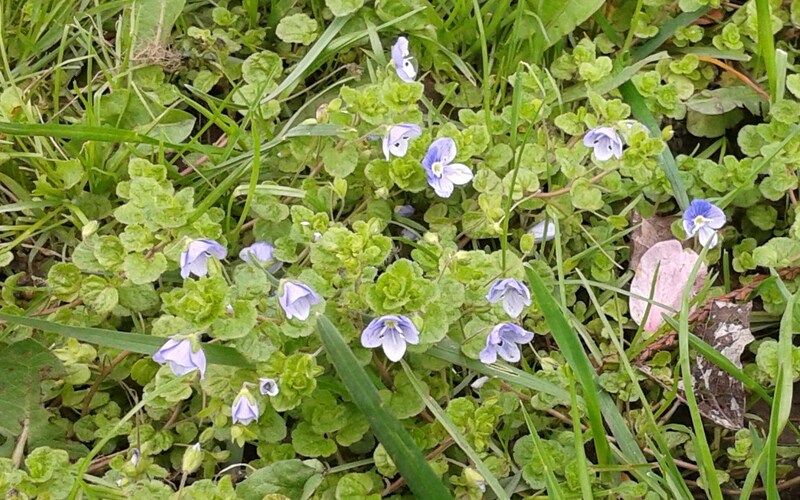 The easiest way to separate it from the similarly large-flowered Common field speedwell is to look at the shape of the leaves. The Common field speedwell has a distinct point at the leaf tip, whereas the Slender speedwell has a rounded tip to the leaf. This entry was posted in Flowering Plants, Plantaginaceae, Plants, Scrophulariaceae and tagged Veronica filiformis, Veronica persica. Bookmark the permalink.